Our sweet Betsy turned one last week! 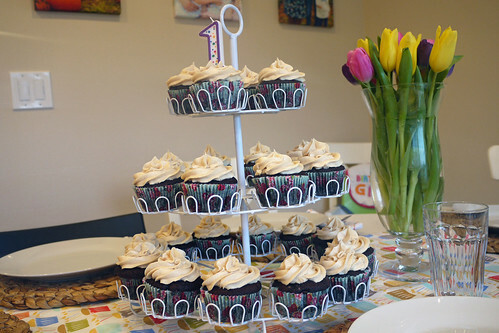 We threw very simple gatherings for Claire's first and second birthdays. She had her first "themed" party with friends at age three. 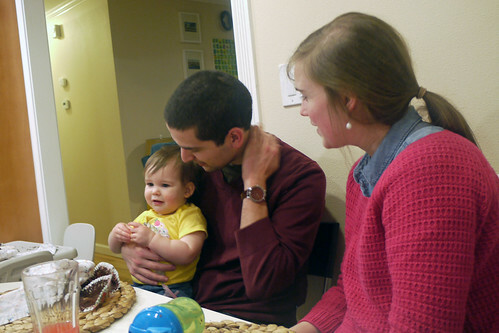 Maggie definitely had more elaborate first and second birthdays; I think mostly because we were excited to finally have a good group of friends here in Seattle! 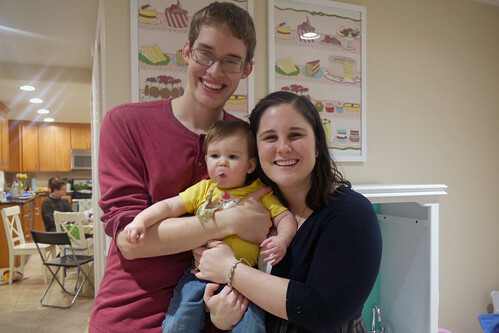 We've come to realize that simple parties really are the right way to go with babies, so that's exactly what we did for Betsy. Her actual birthday was on a Tuesday, but we did absolutely nothing to mark the occasion. She's cut five new teeth recently and was up screaming until 3:00 am the night before, so we weren't feeling particularly festive. Thankfully, she was feeling much better by her birthday dinner on Friday. Adam and I decorated the living room the night before. 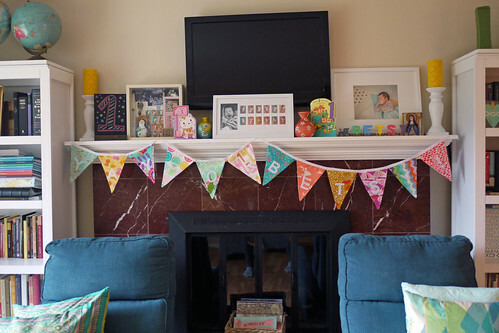 We put her new birthday banner and some nursery decor (shadowbox, monthly photo frame, newborn photo) on the mantel. 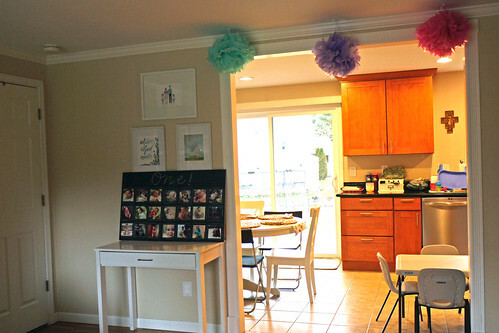 In the garage, we unearthed some tissue paper pompoms from past parties and an old piece of chalkboard, which we used to display some favorite Instagrams from the past year. 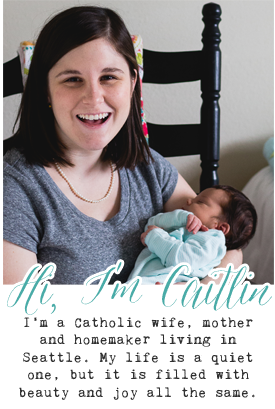 Claire was so excited to see all the decorations when she woke up the next morning that she immediately rushed to her art table and made Betsy a birthday card. 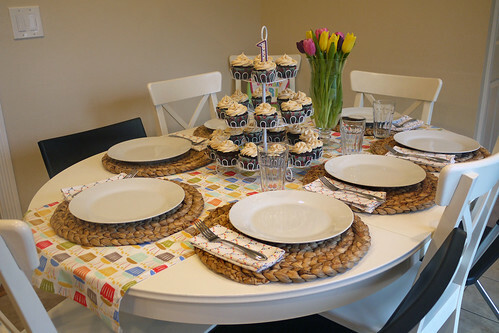 While Claire was busy at preschool, Maggie helped choose the flowers and bake the cupcakes. 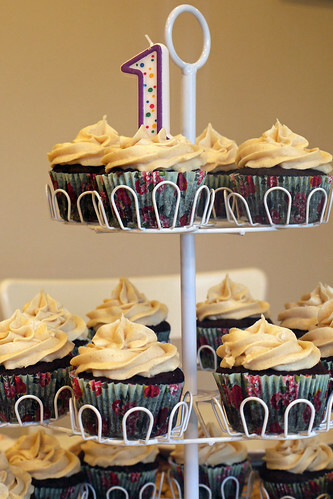 They are our absolute favorite - chocolate with peanut butter cream cheese frosting. 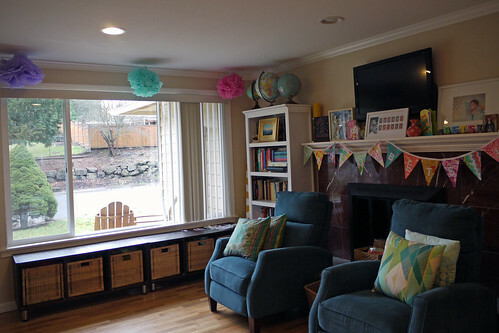 We invited all of Betsy's favorite Seattle residents to join us - her godfather, Steven, and his fiance, Megan, our friend and most gracious babysitter, Linnea, and, of course, Libby and Jon. They are the only people who have attended all of our daughters' birthday parties! Their older daughter, Paige, is right between Claire and Maggie, and their younger daughter, Eloise, (our goddaughter!) is just a couple months younger than Betsy. We served pizza, salad, and clementines (Betsy's all-time favorite food) for dinner. 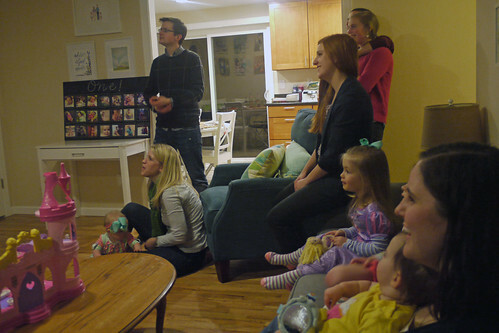 We forced everyone to watch her first year slideshow before opening presents. She did get to unwrap the presents from her grandparents on her actual birthday (a little people fire truck, a toy piano, and some very cute outfits) but we saved our presents for the party. Mostly because I wasn't quite finished with her quilt on her actual birthday! 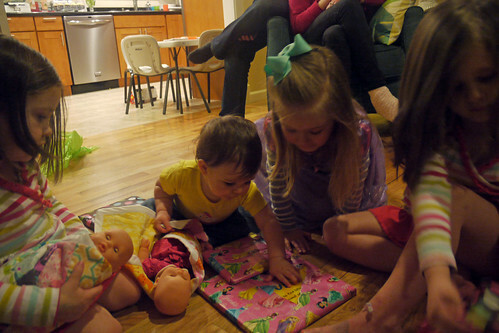 Besides that quilt, we gave her a Corolle baby doll, just like her big sisters' dolls that she had been coveting for months, and a little quilt for her doll that matches her own. 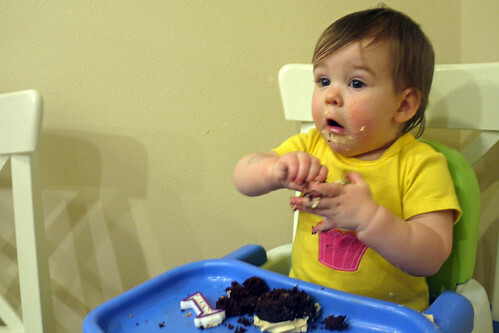 Cake time! 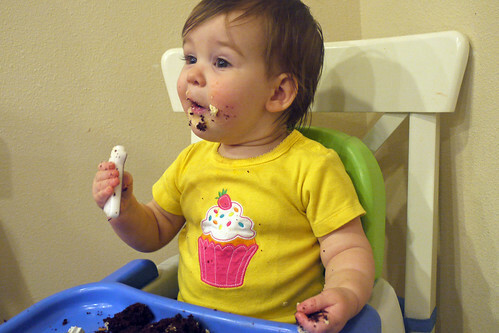 This wasn't her first go around with sweets by any means. 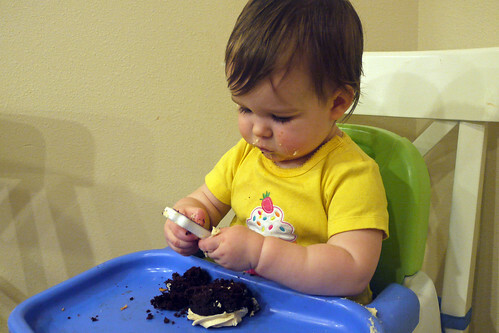 (One of her first foods was Tim Bits on our trip to Canada this summer.) But she loved it all the same. She just learned how to make this really adorable surprised face which she did constantly throughout the party. We had to take a photo with the birthday girl before tucking her into bed. 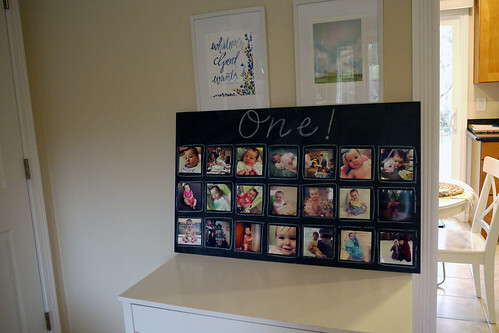 We hardly have any photos of just the three of us! It's become a little tradition to go on a birthday outing. We took Claire to the ballet for her last birthday and Maggie to the circus. 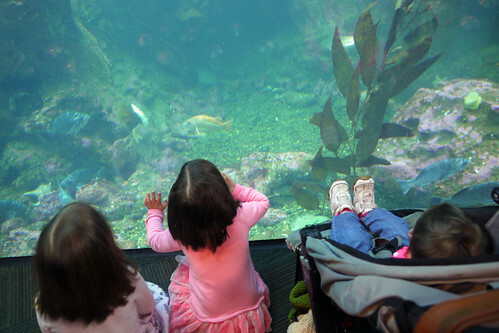 So, on Saturday morning, we all went to the aquarium because we remembered how much the girls loved looking at fish at Betsy's age. 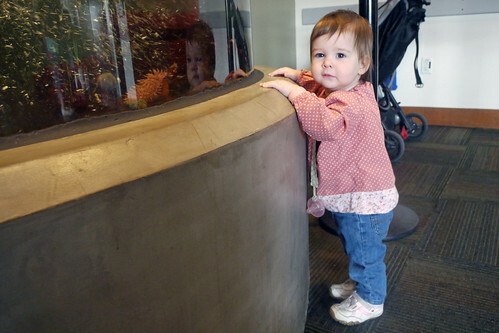 Well, they couldn't walk at her age, so while she enjoyed seeing the fish, she also enjoyed trying to escape from us constantly! How is she so big already?! She's actually quite petite, but what she lacks in size she makes up in personality...and speed.